I’m a pretty big Christopher Nolan fan. I’ve seen all of his feature films (that puts him in select company that includes, but is not limited to, Tarantino, Miyazaki, [Wes] Anderson and Kubrick [well, almost]), and Memento has a permanent place in my top 3 favorite movies. For some reason though, I hadn’t been particularly hyped for Interstellar’s release (well prior to seeing the good, but not great critical response). I think my intuition was on the money. In a not-too distant future, Earth has been struck by a blight that has demolished food supplies to the point of threatening the survival of humanity. Cooper (Matthew McConaughey), a former NASA pilot and current farmer, stumbles onto a last-ditch effort to save humanity by finding a new planet that can support human life. After little discussion, Cooper’s brought in to pilot the mission, putting him at odds with his daughter who has a tough time understanding why her father’s “abandoning” her. Cooper and the mission head out into space while NASA scientists work on another solution to the whole “staving off human extinction” situation… and stuff happens. Interstellar continues the troubling trend in Nolan’s career (I’d say from The Prestige onwards) of compromising on clarity and simplicity in favor of spectacle and needless complexity. The movie tackles some serious and frightening situations that aren’t necessarily uncharted territories in cinema, but it addresses them in what strikes me as a novel way. But things started to fall apart towards the end. The thoughtfulness and care demonstrated by characters earlier on gave way to questionable decisions governed by internally inconsistent motivations. I guess those uncharacteristic decisions could be chalked up to the pressures that the characters faced, but that strikes me as too convenient and honestly a rather lazy and predictable way to introduce conflict. These conflicts catapult the film into its ending, which unfortunately would not actually end. The apparent need for a nice, neat, happy ending is a frustrating one to me and marred the overall experience, leaving me dissatisfied and borderline annoyed. Considering he recently won an Oscar, I know I’m not the only one who’s appreciating Matthew McConaughey’s current resurgence. Cooper’s goals were clear and relatable throughout, and his goodbye with his daughter was hard to watch for all the right reasons (actually, that was the case with several of his scenes with his children). The rest of the cast, including Anne Hathaway, Michael Caine (I won’t be upset if Nolan includes Caine in every movie he makes), and Jessica Chastain, was solid if unspectacular. Nolan’s films have become highly anticipated spectacles since he caught fire after Batman Begins and Interstellar does not disappoint. There are some truly breathtaking visuals (one scene was an absolute assault on my mild hydrophobia… I still can’t help but shudder), and witnessing the implications of time dilation were staggering (for instance, an hour spent on a given planet by Person A would be equivalent to 20 years spent in that planet’s orbit by Person B). What I’ve realized over the last few days is that one of my biggest complaints about the movie is not an uncommon one. 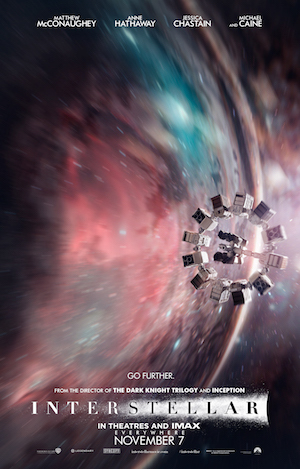 The sound design for Interstellar was generally great, with a beautiful balance and juxtaposition of the loud, full sound of the action inside the space shuttle and the scream-nullifying silence of space. But unfortunately, Hans Zimmer’s soundtrack was often overbearing and distracting, sometimes joining the sound effects in drowning out (what I can only imagine was) important dialogue. Nolan says that this effect was intentional, but it isn’t one that I appreciate. I can’t help but wonder how different my experience will be when I watch this movie at home with the subtitles on. As compelling and thought-provoking as Interstellar often was, I have the lingering feeling that Nolan missed an opportunity to do something special with this material. While there’s a lot to like about this movie (the concept, acting, visuals, sound), the storytelling itself was surprisingly lacking in emotional impact given that the stakes were about as high as they can get. And while I think Nolan’s films have had their fair share of issues, I’m not sure that I’ve felt justified in criticizing the storytelling itself. I think Interstellar is one of those movies that isn’t quite equal to the sum of its parts, and I’d say that’s a pretty disappointing realization.